Emilie Rathou was a celebrity of the political temperance movement and a pioneer in the women’s movement during the first half of the twentieth century. She founded the first Swedish branch of Vita Bandet (the White Ribbon), a Christian women’s temperance organization, which became one of the largest political women’s organizations in Sweden. Emilie Rathou was born in 1862 in Karlskrona. Her maiden name was Gustafsson, but when she began her professional career she used the surname Rathou. Little is known of her family background, but one can surmise that she came from an educated and well-to-do home given that she was the daughter of a businessman who enabled her to gain an education. Emilie Rathou attended a girls’ school and then, as a 16-year-old, enrolled at the teacher training programme in Kalmar, from which she graduated in 1882. Afterwards she moved to Hed in Västmanland, where she worked as a schoolteacher. Emilie Rathou was a teetotaller and believed that there was a strong connection between alcohol abuse and the oppression of women, and this led her to the temperance movement. She became a member of the Godtemplarorden (IOGT, the Independent Order of the Good Templar) in 1884. The following year she earned the Grand Lodge degree and also became a leader of the children’s temple. 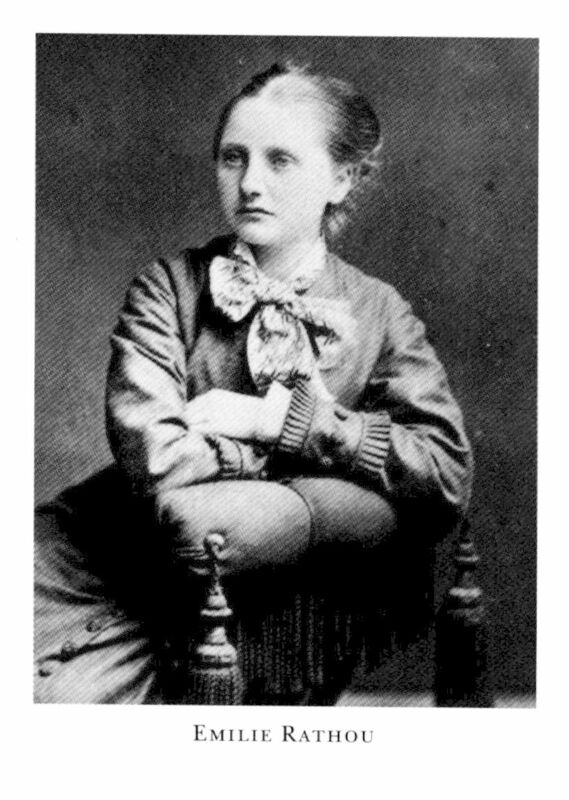 She was then elected onto the IOGT’s district council in Västmanland and resigned from teaching in 1886 in order to become a fulltime travelling lecturer. Eventually she settled in Stockholm. Although Emilie Rathou saw it as her life’s work to create an abstinent society, she also campaigned for women’s rights and responsibilities within public and political spheres of life. She wanted to rouse women from their disinterest and became known in her day as a pioneer of women’s issues and of radical reform politics. She was described as a good public speaker and emerged as a clever and determined activist who used logical arguments and had a strong sense of pathos. In 1891 Emilie Rathou became the first woman to hold a 1 May speech at Gärdet in Stockholm. She spoke of women’s suffrage a full ten years before the women's suffrage movement got started. In 1892 Stockholms allmänna kvinnoklubb (the Stockholm public women’s club) was founded with the intention of promoting the interests of working women and to further their understanding of social issues. However, Emilie Rathou left that club after a few months when it was decided that the club would become part of the Social Democratic party. Politically speaking Emilie Rathou was a free-thinking liberal, but she was also popular with the Social Democrats and in 1893 she was elected as that party’s candidate for the extra-parliamentary people’s parliament. She was elected onto two election circles, and was the only woman among 123 male representatives who discussed general suffrage. In 1924 she was one of the women who set up the Frisinnade folkpartiets kvinnoförbund (the free-thinking people’s party women’s association). Both her temperance and political activities led to the formation of a comprehensive social network and gave her access to the male political establishment. Emilie Rathou was not just a talented speaker, she was also a prolific writer whose style was reminiscent of the demagogic style introduced by the ultra-radical newspapers of the late nineteenth century. She began her writing career by working at a printing house, and then, in 1884, she was employed by Dalmasen, a regional newspaper whose polemical articles spoke out against the king, the clergy and the upper classes. In 1890 Emilie Rathou took over as editor along with Hjalmar Wernberg, and later that same year she bought the newspaper. In order to reflect the greater focus on political content and to lose the local identity tag she renamed the newspaper Svenska Medborgaren and initiated her ownership of the paper by publishing her own article on general suffrage for both sexes, as well as a series on women’s issues. In 1895 she sold the newspaper. As part of her temperance activism Emilie Rathou participated in a series of international conferences. At one of these in Kristiania (Oslo) in 1898 she met Maria Sandström, who became a lifelong friend, and she then decided to found a women’s temperance association. In 1900 Emilie Rathou set up the women’s temperance organization called Vita Bandet (the White Ribbon) in Östermalm in Stockholm. She allied the organization to the global organization called World’s Woman’s Christian Temperance Union (WCTU), an international federation which had been established in the USA in 1883, and founded Vita Bandet along the lines of the American model. Emilie Rathou travelled across Sweden, setting up meetings and founding associations. The number of associations and members rose rapidly from 10 associations with 264 members in 1902 to 114 associations with over 6000 members in 1912. In 1958 the 251 Vita Band associations totalled more than 10,000 members, a record-breaking number. Vita Bandet was a successful organization with Emilie Rathou as its ideologue and main activist and Maria Sandström as organizer. In 1901 a central committee was set up. Emilie Rathou served as chairperson of the Östermalm association for many years, and as deputy-chair of the central committee, as well as its secretary. From time to time her home functioned as Vita Bandet’s office and as editorial office for the organization’s journal, Vita Bandet. Emilie Rathou was the editor of the journal, sometimes in collaboration with other Vita Bandet members such as Gerda Meyerson. She was the pre-eminent public speaker of the central committee and in her role as writer and editor she was the most prominent ideological voice of Vita Bandet. She also edited Vita Bandet’s yearbook Kvinnokrafter for 36 years, and from 1942 she edited the annual newspaper Mors dag. She further co-edited the Christmas paper, Jultoner, for several years. She also worked intermittently for Nordisk familjebok. Vita Bandet was Emilie Rathou’s lifelong achievement and her personality, competency and social network lent the organization a level of recognition which gave it considerable political weight. Through her the organization had representatives in a range of other associations: Emilie Rathou was a representative in Sveriges Nykterhetssällskaps Representantförsamling, Förbudsvännernas Rikskomitté, Centralförbundet för nykterhetsundervisning and Riksutskottet för de kristnas förbudsrörelse. In 1911 she was recruited as the sole female member of the government-run abstinence committee, which prepared the ground for a referendum on prohibition in 1922. In 1919 she was appointed to the board of enquiry into prohibition before the referendum. In order to disseminate information and advice regarding the referendum she organized a three-day “Kvinnornas förbundskongress” (women’s association congress) with over 2000 participants in 1921. A new organization was established at the congress called “Centralrådet för kvinnornas förbudsarbete” (the central council for women’s prohibition efforts) and Emilie Rathou was elected as its chairperson. In 1926 she initiated “Nordiska kvinnoförbundet för alkoholfri kultur” (the Nordic women’s association for alcohol-free culture) at the Nordic abstinence meeting in Dorpat and in 1934 she led the efforts to hold Vita Bandet’s world congress in Stockholm. Emilie Rathou dedicated her life to working in support of abstinence and women’s rights in society, in politics and in the work environment. She was one of Sweden’s most famous women in her day and in 1918 she was awarded the Illis Quorum by the government in recognition of her contribution to Swedish society. Emilie Rathou spent her life, through Vita Bandet, trying to create a teetotal, egalitarian and democratic society. Emilie Rathou died in 1948 and is buried at Bromma cemetery. Emilie Rathou, www.skbl.se/sv/artikel/EmilieRathou, Svenskt kvinnobiografiskt lexikon (article by Åsa Bengtsson), retrieved 2019-04-26.